BOSTON, Massachusetts, USA -- Thursday, October 1, 2009 -- The Free Software Foundation (FSF) today announced that it will begin rewarding those who find and report any nonfree components in free software operating system distributions with public recognition and “GNU Bucks.” The FSF maintains a list of guidelines covering what it means to be a free distribution, and endorses distributions that commit to meeting those guidelines. “By spurring users to find and report problems, this new awards program will help make sure that the FSF-endorsed free distributions of GNU/Linux stay really and truly free,” said FSF executive director Peter Brown. “Ever since we published the guidelines for what it takes to be a free system distribution, we have been looking for practical ways to deal with the issue of nonfree software that is accidentally included in these distributions -- steps that are within our means and the means of distribution maintainers. This new program does a good job of striking that balance,” said FSF licensing compliance engineer Brett Smith. Those qualifying for the award will receive a “GNU Buck” bank note, in the amount of pi and signed by Free Software Foundation president and “Chief GNUisance” Richard Stallman. In order to qualify for the GNU Buck award, someone first submits a detailed, actionable report about nonfree materials in a free distribution to both the FSF and the maintainers of the distribution. If the report is confirmed, the person will receive an award and the option of public recognition. The FSF will also notify other free distributions to make sure they can address the issue as well. 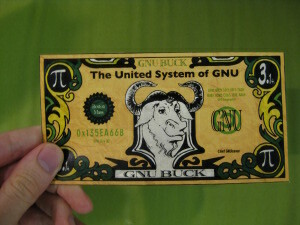 A full explanation of the program is at http://www.gnu.org/help/gnu-bucks.html. For more information on the FSF's criteria for classifying a distribution as free, see http://www.gnu.org/distros/free-system-distribution-guidelines.html. The full list of distributions meeting these criteria is published at http://www.gnu.org/distros/free-distros.html. The free software movement's goal is freedom for computer users. Some, especially corporations, advocate a different viewpoint, known as “open source,” which cites only practical goals such as making software powerful and reliable, focuses on development models, and avoids discussion of ethics and freedom. These two viewpoints are different at the deepest level. For more explanation, see http://www.gnu.org/philosophy/open-source-misses-the-point.html.